Only one more week until the opening of the Port Townsend Farmers Market! Our new and returning vendors are excited to welcome you with early spring produce, cheese, meat, cider, wine, bread, pies, cookies, coffee, delicious prepared food, fish, shell fish, flowers, and a variety of arts and crafts. Check out the event line up at the bottom of this email for more information. Partners Frank Rick and Wakinda Blankenship will help us kick off the market season as new vendors. They and their business, the Heartwood Center for Spiritual Pursuits, recently relocated from Lake Stevens, WA to Port Townsend. They look forward to building community as well as sharing their art and culture with us. Wakinda, a Native American from the Monacan Tribe of western Virginia, is a Reiki Master and Medicine Woman. Frank, born and raised in the Seattle area, is a drum maker and artist. Together, they will bring hand-made drums, fans, walking sticks, as well as other art to market. Frank builds each of these pieces by hand drawing from years of study with Native American teachers as well as his background in woodworking. While Frank is not Native American himself, he has been "walking the Red Road" for 20 some years. The term, "walking the Red Road," refers to intentionally living a life of truth, humility, respect, friendship, and spirituality in line with Native American teachings. In 2016, Frank and Wakinda joined forces to start the Heartwood Center for Spiritual Pursuits to share healing and spiritual practice as well as drum and other art making with their community. The natural world of the Olympic Peninsula drew them to Port Townsend. They love camping in the nearby forests and mountains. Frank was familiar with Port Townsend from participating in the Rhody Run in his youth as well as paddling in the Canoe Journey, which stops on the Port Townsend shore. Visit the Heartwood Center booth to meet Wakinda and Frank, learn about the 2018 Canoe Journey, and enjoy Frank's flute music. While you're at their booth, check out Frank's detailed hand work. 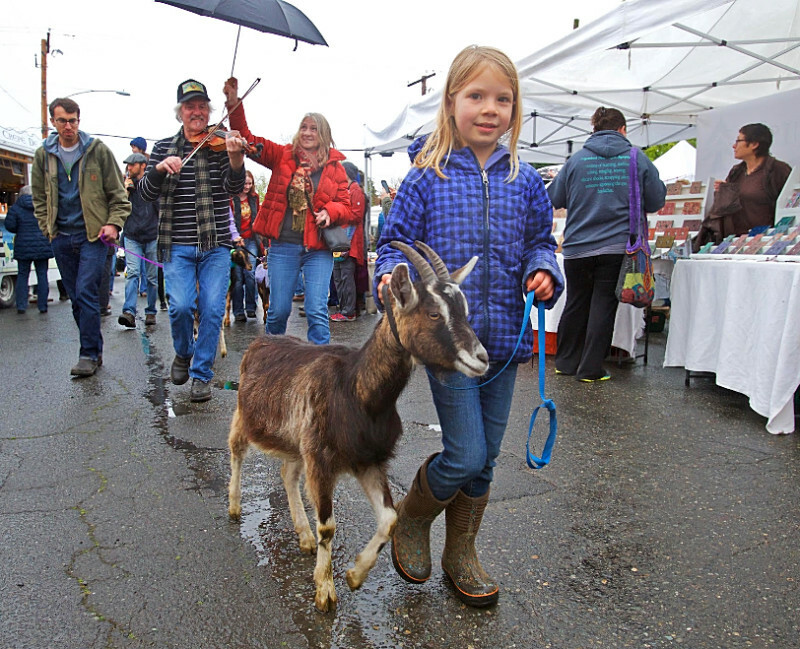 9:10am, goat parade with baby goats from Harmony’s Way and Mystery Bay Farms. Come in animal costumes for a chance to win a $20 Flora Market token.